Build Away lets you build a city of your dreams in a unique way. You will construct homes, cafes, banks on empty spaces, invest on power and construction and the buildings will earn money for you. The money can then be reinvested in constructing newer, bigger buildings. Build Away is different from other games like City Mania, but the gameplay is very addicting. Delivering delicious ice-cream was never this much profitable! Tap the ice cream center and watch a short ad to deliver tasty ice cream to citizens. The ice cream truck will be out for delivery and you will receive more earnings from buildings as long as the ice cream truck keeps moving. The ice cream truck will keep delivering free ice cream within a certain time limit. You can see how many hours are remaining and the profit multiplier beside the ice cream center. Once the timer reaches zero, the ice cream truck will stop and get back to its place. You will also stop getting increased profits. You can keep the ice cream truck moving by extending the timer. You can do this by watching a short advert. Every time you watch a video, you extend the delivery time by 2 hours. You can extend delivery times up to 12 hours. The Carnival is another way to earn quick bucks. During carnival, coin multipliers increase the profits earned by your buildings for a few seconds. When it starts, a timer is shown on the screen and the multipliers remain active until the timer hits zero. 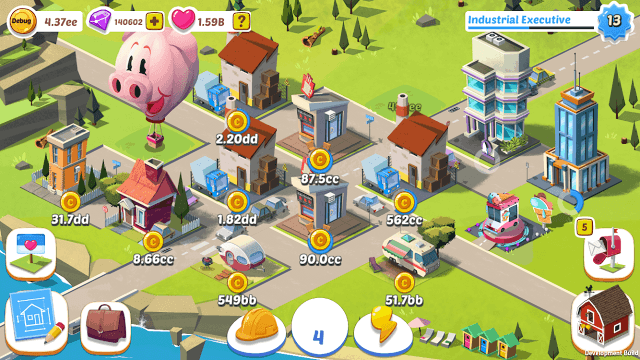 All you have to do is swipe quickly to collect the coins accumulated by your buildings so that they keep producing more with the multipliers turned on. This way, you will earn huge profits in a short period of time. Look for a large pig face helium balloon. Tap it and then tap the “Start the Carnival” button. You will have to watch a short ad to start the carnival. After you have finished watching the video, the carnival starts and you will have quickly swipe all over your buildings to collect the coins accumulated by them. Keep swiping until the carnival timer hits zero. Investing in construction is a sure-shot way to boost earnings. Tap the hard hat icon at the bottom of the screen and investment meter appears on top of every building. Tap the meter on top of a building to fill it. Remember that every time you tap, you spend coins. Also, coin requirement to fill the meter increases after every tap, so make sure you have plenty of cash available before investing. Once the investment meter fills up, you earn more profits from that building. Keep filling the meter above a building to double your profits. Build Away’s briefcase may contain lots of coins, some gems or hearts. Sometimes it may contain a duplicate building card. Don’t worry if you get one from a briefcase. It will contribute to your building upgrades. You will have to collect a certain number of duplicate building cards to upgrade your current building. An upgraded building will provide better returns. To check how many duplicate buildings you will require for each building to get upgraded, tap the Briefcase icon and then tap “Building Collection”. You might get a free briefcase by watching ads, reaching building milestones, starting carnivals or swiping profits. In case you don’t want to wait for a random briefcase to pop up on the screen, you can always invest some money buying a “Normal” briefcase but do remember that every time you open a briefcase, the price for opening a new one increases. You will need “Power” to speed up production time and automate production. For a new building, you will have to first invest coins to enable power meter. Once the meter appears, tap to fill it. When the meter fills up, you will notice a drastic improvement in production time. You will earn money faster than before. Prior to enabling power, your newly developed house could have only earned once until you tap on it. With Power on, your house will keep earning coins for you automatically, at a much faster rate. When you raise a new building replacing the older one, you will have to enable power for the new building before filling the meter and enabling automated/faster production. 6. When Does a Power Outage Occur and What Should You Do About It? A power outage can temporary stop automated production and may lead to slower production times. This usually happens when the construction level is higher than the power level. When you invest on construction by tapping the hard hat icon, or invest on power by tapping the lightening icon button, you may have noticed a tiny number above each construction/power meter. The number shows the current construction/power level and it increases when the meter is full. When the construction level of a particular building is higher than the power level of that building, you will need to worry a bit as the both power and construction need to be on the same level to avoid a power outage. An exclamation mark usually appears above a building where the power level is lower than the construction level. What you can do is tap the power icon and fill the meter until it reaches the end of the pink part of the meter. The XP meter at the top-right corner of the screen fills a bit every time your swipe the screen for profits. It also fills up when you upgrade buildings, reach building milestones, complete a carnival or watch ads.